The cutest relationship bond that one shares in his life is the chord of marriage. It binds two individuals and they remain together, forever keeping alive love and care in the bond till the end. Marriage anniversary is the special day to celebrate the vow of love and commitment and in such a wonderful moment of life what could be more blooming gift than wonderful flowers. Whether you are celebration your special day of love or want to present a beautiful anniversary gift to happy couple associated with you, noting can beat the best gifting choice other than flowers. Flowers are not only the beautiful presentation of love, but they are also the secret messenger of in-heart feelings. When you feel that there is dearth of words or you want an expressive way to convey your message on the special day then take the aid from beautiful blooming flowers. Rose, Lilies, Carnation, tulips, orchids make a beautiful flower bunch presentation as anniversary gifts. Few of very attractive and favorable flowers presentation on the day could be special rose arrangement, heart shape flower arrangement, rose bunches, assorted rose bouquets, mixed flower romantic bouquets etc. No matter whether it’s the big day celebration of marriage of yourself or you wish to convey best wishes to a happy couple who is near to you, use flowers as the medium to beautifully convey your message. 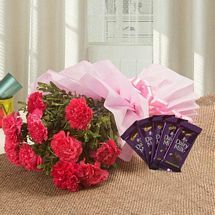 To give a pleasant surprise to your spouse of happy couple Send Anniversary Flowers Online to India and we will provide you free shipping in all the metro cities as well as the rural localities of the country.